As I drive 3 miles to the grocery shop to buy fresh cream for a special occasion cake I plan to bring to a Sicilian lunch, I pass lush green pastures with cows contentedly munching on grasses mixed with wildflowers. When I arrive at the grocery store, I see that there is no fresh cream in the dairy case. There is something being sold as whipped cream in a can, and the label contains sugar, vegetable oil, water…by the third ingredient there is still no trace of a dairy product. This will not do. Not when I’m trying to make a good impression on Emanuele’s sister Nella, who is a brilliant cook and also “la regina dei dolci” – the dessert queen of the family. Everyone, that is, except me. I feel left out. I need a cow to have whipped cream on my strawberry cake? The woman behind the counter motions to the ricotta. “E’ appena arrivata – it’s just arrived,” she says, “from this morning’s milk- it’s still warm.” Apparently everyone who has a cow doesn’t make ricotta. 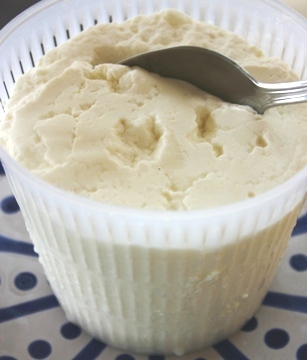 The ricotta is the color of sunbleached straw, and rests in little slotted tubs, dripping whey into a pan. She also has yesterday’s ricotta, which having had 24 hours to drain, is thicker and drier – it depends on what I want to use it for. Making ravioli? Get yesterday’s. Eating it with a spoon? Get today’s. The ricotta lady smiles and says “Comunque la mangi sarà buonissima” – however you eat it, it’ll be delicious. I think about this for a moment, imagining strawberries and ricotta, and my taste buds tingle. So, I go with the ricotta flow, and buy a tub of yesterday’s and because I want to dig my spoon into it, also one of today’s. On the way home, I pass the Occhipinti farm where this ricotta comes from, and wave to the happy cows – grazie! 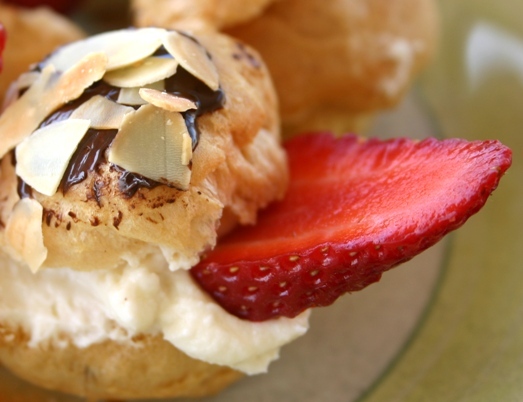 I also revise my dessert plans, and decide to make cream puffs, but stuff them with ricotta. I make different versions of them – some with dark chocolate and strawberries, others with lemon and almonds – and they are a huge success with everyone. Nella, the family dessert queen, pronounces her strawberry puff to be buonissima, then eats a lemon one – buonissima. Someone finds the bowl of leftover filling in the fridge and eats a spoonful. Buonissima. So the ricotta lady was right. I eventually end up using this dessert recipe as part of a 1-day cooking class in our Sicilian kitchen. To make a ricotta filling, beat 1 lb. of ricotta with ½ teaspoon of vanilla, a pinch of cinnamon, and sugar to taste. You will need high-quality fresh ricotta for this filling to be buonissima. Or, get yourself a cow. Please tell me where to purchase the occhipinta ricotta cheese. I live in New Orleans, La, I have perfected the flavor but need a dry ricotta. Help? So close…..
Donna Maria- The wonderful Occhipinti ricotta is only made and sold locally here in Sicily, so’ll you’ll have to come if you want to taste it! All the fresh ricotta here does not travel, and has a shelf life of a maximum of 4 days. When you mention “dry ricotta”, are you referring to a ricotta salata (salted ricotta) that you can shave over pasta? This is traditional for pasta all norma, a Sicilian dish made with eggplant and tomato. I would suggest that you research a gourmet cheese shop for this, as it can be shipped. Good luck and let me know how it goes!